Angina drug becomes erection improver // long-banned sedative, leprosy medication // pain reliever, stroke preventive // all cheaply // quickly // serendipitously. The verdict was in: UK-92480 had failed. Scientists at a Pfizer laboratory in Sandwich, England, had thought the compound showed promise for treating angina. But the drug never made it out of preliminary clinical trials. A single dose had only a fleeting effect on the circulation of the volunteers who took it, and multiple daily doses caused muscle aches. It appeared that UK-92480, as with so many compounds tested by the pharmaceutical industry each year, would be shelved. But a number of men taking UK-92480 reported an unexpected side effect: improved erections. Pfizer scientists initially dismissed that result, then decided to test the compound in men with erectile dysfunction. The rest is pharmaceutical history. 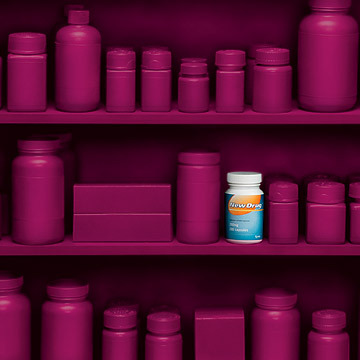 In 1998, the drug, renamed Viagra (sildenafil citrate), became the first oral impotence medication approved by the U.S. Food and Drug Administration. Because of Viagra, a growing number of scientists and physicians have become intrigued by the potential of “drug repositioning”—finding new ways to use established compounds that have been tested and found safe in clinical trials. “In a sense, drug repositioning has a long history,” says David J. Sullivan Jr., an associate professor of molecular microbiology and immunology at the Johns Hopkins Bloomberg School of Public Health. “But now we’re trying to take a more systematic approach rather than just relying on chance.” Sullivan is co-author, with Curtis R. Chong, an intern at Massachusetts General Hospital, of “New Uses for Old Drugs,” a widely cited 2007 commentary in Nature that makes the case for screening large numbers of both established and experimental human clinical compounds to detect unrecognized benefits. The long list of drugs that have undergone a chance change of identity includes the notorious sedative thalidomide, which was pulled from the market for causing birth defects and has morphed into a treatment for leprosy complications and multiple myeloma. Iproniazid, the first modern antidepressant pill, was initially tested as a tuberculosis drug. And then there’s aspirin: Originally created to treat pain, it’s now taken by millions to reduce the risk of heart attack and stroke. All these new uses came about because physicians noticed that patients who took the drugs responded in unforeseen, favorable ways. But intentional drug repositioning is more active: a methodical hunt for any stealth benefits a known drug may offer. Drug repositioning—also known as repurposing or reprofiling—seeks to put that activity to work in therapeutic ways, which is something doctors do every day in clinical practice when they prescribe medications off-label—that is, for uses other than those approved by the FDA. Examples include albuterol, a bronchodilator that’s approved for treating asthma but is sometimes prescribed for patients with chronic obstructive pulmonary disease, and the anticonvulsant gabapentin, which is often prescribed for pain. Widely accepted in medical practice, off-label prescribing is not regulated by the FDA. But the kind of repositioning gaining momentum is more systematic and may require a nod from the FDA for compounds that haven’t made it through the approval process. Even so, it is often a much faster, cheaper alternative to start-from-scratch development of a drug. “Interest in drug repositioning is growing because of the high failure rates and costs of bringing new drugs to market,” says Edward Tobinick, an assistant clinical professor of medicine at UCLA’s David Geffen School of Medicine. Tobinick is studying the effects of the arthritis drug Enbrel (etanercept) in patients with Alzheimer’s disease and other conditions. Recycling existing medications seems like a concept tailor-made for today’s challenging economic climate, and focused efforts to find multiskilled drugs have begun to produce some unlikely linkages. There are antibiotics that may one day be used to treat neurological diseases and autoimmune disorders, heart and antifungal medications that show promise as cancer fighters, and failed ulcer drugs that could prove useful in treating type 2 diabetes. Yet while efforts in universities, clinical practices and the pharmaceutical industry are growing, several obstacles remain before drug repositioning can become a steady, mainstream source of new medications. 1. “New Uses for Old Drugs,” by Curtis R. Chong and David J. Sullivan Jr., Nature, August 2007. The authors make a passionate case in favor of drug repositioning, particularly for increasing the availability of affordable medications in the developing world. 2. “The Value of Drug Repositioning in the Current Pharmaceutical Market,” by Edward L. Tobinick, Drug News and Perspectives, March 2009. Tobinick presents drug repositioning as an important alternative approach to discovering new therapies in a difficult economic climate. 3. “The Year’s New Drugs & Biologics—2008,” Drug News and Perspectives, January/February 2009. An in-depth report on the 31 new chemical entities and biologics introduced last year shows that nearly 40% weren’t new at all, but rather repurposed or reformulated.